Why for you no buy car? No make mistake. You buy car. You love. Get fun. Go now. Not a Desoto ! I am leaning toward a CT Royal or a CQ "small" imperial. Seems to have been involved in a fire. 1941 super convertible ...Stunning ! All the Duesenberg trunks I've seen have an indented left rear corner allowing room for the gas tank filler pipe and cap. I know because I own a Duesenberg equipped with a trunk. Uncertain if maybe some of the cars were configured for a plain-shaped trunk like this one. Is the first picture "Home" ? Question; what on earth are you going to do with the behemoth ? Well here are some production figures on the Hupp Model I A totol of 664 cars were produced in 4 different body styles. 4dr sedan, 2dr Victoria,cabriolet roadster and coupe. I do not have any figures that tells how many of each body styles were produced. The model I had a 126 in. wheel base. The model F had a 122 in. wheel base. The Model I had a larger engine 110 hp while the F had 106 hp. The body on your car looks like it does not have a lot of rust through, that's good. I sure hope you have the trunk cover If you do not, you will find it very hard to come by. I love stock Hupps, I do have some great friends in the Hupp club with modified cars, Some you look at them and can not tell it from stock Others , you can see they are not. It would be a dull if we all liked the exact things. 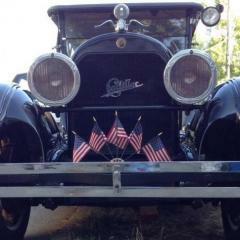 You have a Hupmobile model that a true Hupp guy would love to have, Enjoy it. When I get my other computer.on line, I will post some pic. Greg, I do not think there is any issue on scope. If you would be able to provide them with the info they need to make the part there would be no problem is my guess. For the price of a membership, it would be worth it to try. Basically a cost of an ad somewhere! Like the Chrysler CO photo I posted. 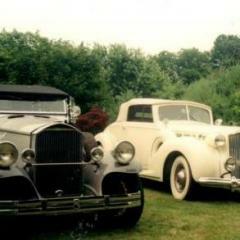 Definitely not an Imperial as they did not have a 2 door conv sedan.. A friend had a 1932 DeSoto conv. sedan 40 years ago, great driving cars. I believe that the 6 cylinder Chrysler of the same vintage shared the body as well and possibly the 1932 Plymouth model PB. or at least the main sheet metal body panels, seat and window frames and other body hardware etc. My shop has morphed into a good example of poor layout..........I have three different work areas, which means the tool I need is never in the right place, so I have duplicated lots of tools. I would love to have one of those big "professional" tool boxes but which area would I keep it in? So I have a total of 4 cheap tool boxes (must have ball bearing drawers) scattered about. The most embarrassing part of the shop is the 16" work bench that is so cluttered I have a usable work space of about 3 sq ft to work. I dont suppose you still have this? Nice car. And it's got the "Chevron" dash! Not sure about the supposed rarity, though. I don't go to that many shows, and I've seen a couple of them. Just lucky, I guess. Fair asking price. Within the AACA, cars are judged at national meets if the owner so desires. At a car's first appearance at a meet, it is eligible for a "Junior" award: First Junior, Second Junior, or Third Junior. At a subsequent national meet, the cars who previously achieved the First Junior level can try for the Senior award. The national meets are held around the country, and the location of the meets often change each year. A car must be pre-registered, often a month or two in advance. At any national meet, quite a few cars may receive the First Junior or Senior award. To be "first" doesn't mean that yours is the only car in your class, or the only car at the show, achieving that level.